1-CD with 36 pages booklet, 30 tracks, playing time 73:34 minutes. 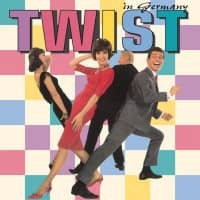 Twist was a fashion dance of the early sixties. But he was also a good part of life. Worldwide! Because rhythm and dance prevailed. What began in the Peppermint Lounge, a nightclub in New York City, sloshed across the Atlantic like an all-consuming flood. The first effects could be felt in St. Tropez, then in Rome, London followed and also the economic miracle Germany could not be called twice on the dance floor. 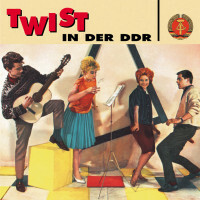 All popular twist titles from Germany, which were the big sales and dance hits on 45 single records at that time, are included on this CD. Start of a new, exclusive Bear Family series after'Pop in Germany' and the CDs'Twist in Germany' and'Surf in Germany'. Song classics in rare German versions, plus some original versions! rare pieces celebrate their CD-premiere here! Almost every time Anglo-American titles entered the local charts, they were mercilessly Germanized. These cover versions are more popular with oldie fans today than ever before. 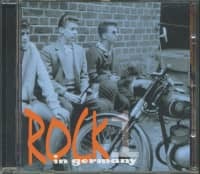 After Twist & Surf (to which own CD-couplings were dedicated), Pop & Soul, Country & Folk, Beat & Bubblegum (which were honored on'Pop In Germany' and will continue to come) - now the rock'n' roll era must believe it. 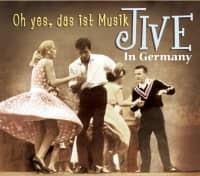 Rock in Germany' presents hits and rarities from that time when Rockabilly & Rock'n' Roll lifted the intact German pop world off its hinges. For fans and collectors once again the opportunity to discover long sought-after treasures, because even on record fairs or on the Internet the vinyl originals are hardly to be found today. And if it does, then often at horrendous prices. This time stars like Peter Kraus, Ted Herold, Tommy Kent, Hans Blum and Bernd Spier are honoring each other. But there are also numerous names represented where the penny simply won't fall: Hannes Wüst, Tony Ronald, Frank Olsen, Conny Quick, Hans-Uwe Schneider, Ronny Twen - to name but a few. And what did they cover? Songs of rock greats like Chuck Berry, Bill Haley, Dion, Del Shannon, Cliff Richard, the Everly Brothers and many more. Bruce Channels Hey Baby as well as a so far undiscovered cover version of the Elvis hit I Gotta Know. And if you haven't heard the German version of Buddy Holly's That'll Be The Day - you can listen to it here. A special highlight should be Dion's Drip-Drop, sung by Pichi. Do you like musical jewels of a special kind? Here you go, on this sampler they are abundant. Customer evaluation for "Twist in Germany"
16 Bitte bleib bei mir!